iTunes library has a database that contains all the music and media that you add to iTunes. iTunes library comes with an ".itl" file that stores your media library data. If your iTunes Library.itl cannot be read, it displays a message on your screen that reads "The file 'iTunes Library.itl' cannot be read because it was created by a newer version of iTunes". This means that the Library.itl file has been damaged or corrupt. If you unfortunately find yourself in this position, and you’ve tried searching for solutions only to end up with zero result. Do not fret yet as this article will help you fix iTunes Library problem. Here, we will show you different ways to help you get iTunes library repaired. Step 1Exit iTunes completely and make sure it’s not running underground. Step 3Copy and paste the file somewhere else. Say your desktop or any other folder. 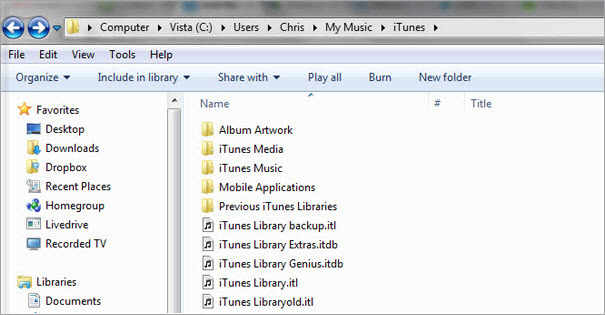 Step 4Rename the iTunes Library.itl file on your iTunes folder to "fixing iTunes Library.itl". Step 5Still in the iTunes folder, click on the folder named "Previous iTunes Libraries" and you'll find a recent version of your iTunes Library.itl file. Copy and paste to where "fixing iTunes Library.itl" is and rename it to "iTunes Library.itl". It does not recover changes you’ve made to your recent iTunes library which has been corrupted. It is less efficient to rebulid iTunes library. It might lead to the loss of some of your files. It only restores outdated iTunes library. Taking all these disadvantages into consideration, it is reasonable and better to switch to a more appropriate method to have iTunes library recovered. With an iTunes alternative, things become much easier. Check out below to repair iTunes library with iMyFone TunesMate. Integrated with advanced technology, iMyFone TunesMate is designed to repair, rebuild, recover, and fix iTunes libraries, enabling users to well control their iTunes media files. The iTunes alternative allows users to transfer unlimited files between iDevice and iTunes/PC without hassle. Having a corrupt iTunes library can be heartbreaking, but thanks to iMyFone TunesMate, recovering iTunes library is as simple as ABC. Restore and rebuild crashed or damaged iTunes library without losing data. Enrich iTunes library from unlimited iPhones, iPads, and iPods, even in different Apple IDs. Merge different iTunes libraries together without any duplicates. Share iTunes library to different iDevices unlimitedly. Both free and paid iTunes media can be restored. 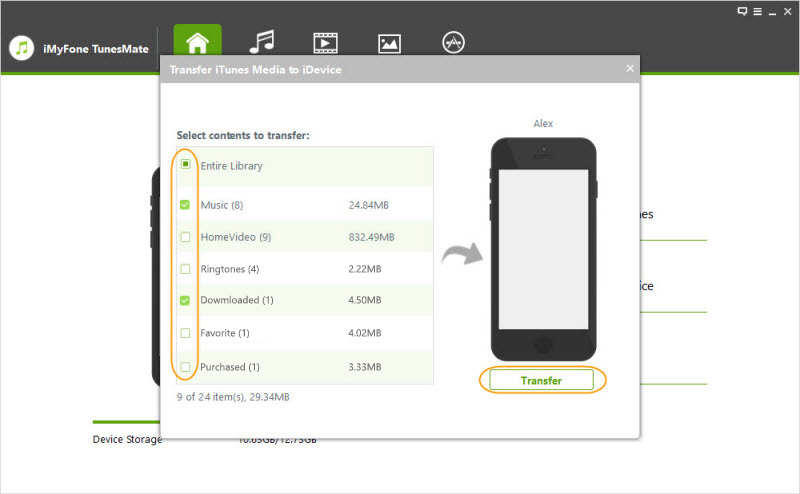 Two-way free transfer media file between iOS devices and iTunes/computer. Step 1Click on iMyFone TunesMate to launch the software on your computer. Connect your iOS device to your PC , and TunesMate will detect your device and display it in the Home interface. Step 2On the interface that displays click on "Transfer iDevice Media to iTunes". Step 3Select all the files you want to restore by checking its individual check boxes. If you want to recover the entire library, select the entire Library and then click "Transfer". Step 4Once it’s done, click "OK" and your library will be successfully recovered. It easily rebuilds your entire iTunes library from your iDevices using previously synced data. It has the option to preview and select specific files you want to move to iTunes when trying to fix your iTunes library. It has the ability to copy data without overwriting, deleting or duplicating any previous files. 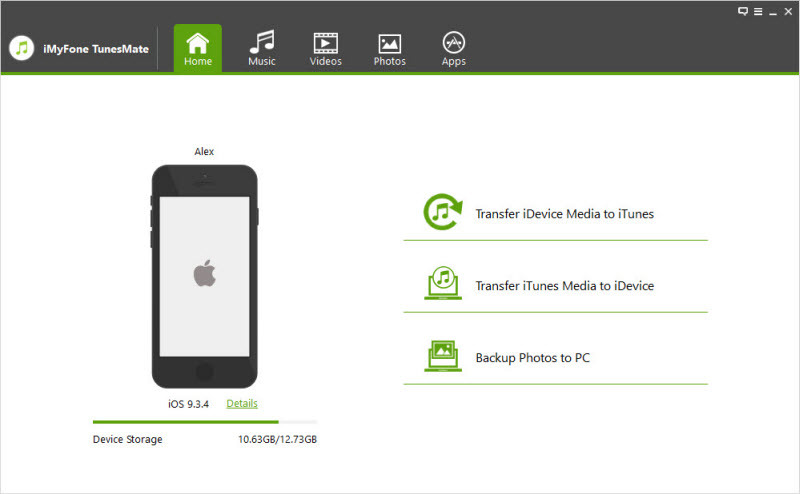 It allows users to efficiently manage any iTunes library across all your devices in a professional way. From practical perspective, the second method is much more useful. Most importantly, it won't erase any data on your iOS devices during iTunes library repairing.